So I fell behind posting my advent illustrations on the blog. I think I'm going to research posting here directly from Instagram for future illustration series to keep things simple. Below are all the remaining illustrations for this advent challenge. When I started out on this challenge I imagined that I would have 24 illustrations that would all go together into one collection. It didn't quite turn out that way. I have the possibility of a few collections from these pieces - many need refinement and tuning. A few I will just discard or maybe completely redo. I've made a few notes about each illustration below mostly for my own reference. I discovered that the Christmas season is a really busy season and it's a huge struggle to complete so many illustrations on such a quick timeline even when I started early. But I'm going to take what I learned and grow next year! I like like the color combination and the pattern combination in this stocking. I think I should explore this as a stand alone pattern for a Christmas collection. I really enjoyed working on this gingerbread boy. I'm currently revisiting the baking pattern in the background. If you want to see this background as a fully developed pattern check it out on They Draw and Cook! This swan is so dainty and so soft and the colors very calming. This illustration is where I began to deviate from the style that tried to carry through this challenge. But it's okay - I discovered something new for me. I think a nice nursery collection could be explored around this piece. I wanted to do so much more with these mittens but the number of pieces I was working with kept crashing my computer! I will go back to it in the near future as well. This illustration is where I realized that to do a challenge like this I had to work more quickly and simplify my ideas. That doesn't mean I can't explore more later. This snowflake pattern is pretty straight forward. But for future reference I learned from a friend that snowflakes only have six points. I got a lot of great feedback from this pair of clogs. I like the color combo here. This little rocking horse was done on my new iPad Pro completely in Adobe Draw. I did it while traveling. I had my logo saved into a Creative Cloud library and was able to create and post the entire piece while I was mobile. This church was also done remotely. This was the first illustration in which I realized that a square format did not suit all of my illustrations. There are a couple of illustrations like this which I felt were too far removed from the viewer because of the square composition. I'll note to plan accordingly next time around. Instagram does allow rectangular images to be posted now so that's an option if I desire. This Santa was also to tall for the frame. I got lovely feedback about the patterns on his outfit, though. This is my least favorite illustration of the entire challenge. After my 100 Patterns challenge maybe I'll do a hand lettering challenge. I really like the composition of this illustration as well as the color palette. This illustration was also drawn on the iPad Pro but in ProCreate this time. I really like these stockings! I had fun being able to achieve subtle shading in this app. Again you can see that my hand lettering weakened the piece. For this illustration I continued my experiments on the iPad pro. This illustration was done in Adobe Sketch. It's very similar to last years Christmas illustrations which I painted in Photoshop using Kyle's brushes. I liked all of the pieces of this composition but had a hard time fitting them together into the square format. It turned out okay in the end. This was also done on the iPad Pro. This candy cane pattern was done using scanned and image traced artwork. Instead of keeping the brown linework like in the first illustrations I chose to use colored linework. It created a very different feel. I think this is a pretty strong pattern for a Christmas collection I'm just not sure what to pair it with. I think it could work well with the snowman. I have a lot of playing around to do, though. This pattern was by far the most well received. I do like it a lot even though there are lots of small adjustments and finishing touches to be done before it is market ready. One things I really need to do is to simply the number of colors that I used which will be quite a challenge. The last illustration in this challenge was Christmas village. This little pattern was a lot of fun but it's not very Christmasy as is. I have a lot of finessing and many details to add. I worked really hard to get a repeat that worked. I want to do four versions of this pattern - one for each season. I hope you are all merry and bright and are enjoying this bit of colder weather! Can you believe it is already Day 6 of advent? Today is the last day of our co-op classes and tomorrow the boys leave for their annual Christmas trip to their grandparents. I had fun creating this illustration. I knew that I wanted to do a patchwork tree. I created all of the little patterns that you see here - just super simple geometrics mostly. Nothing worthy of my 100 Patterns Project. I'm also continuing to play around with my backgrounds for these illustrations. I'm not quite what to do with them sometimes. In this illustration I created my first vector plaid. That was fun and I want to play around with that some more. In other news this was my first illustration using my brand spanking new iPad Pro. I drew almost the entire illustration using an app called AstroPad. It's still in that awkward stage for me but I know that I'm going to continue working in this way just for the sheer convenience. I can even sit at the school table with the boys and work while they do their lessons! 'a light shining in the darkness but the darkness does not overcome it'. It's a good image for these dark advent evenings. I feel like this illustration came together the easiest of any that I've done so far. That makes sense, right? I've begun to come up with a workflow that is suitable for this style. I really love the color scheme and folk painting look of this illustration. I began drawing a pear and before I knew it this sweet bird had decided to move in. It made me laugh to think of a partridge in pear rather than in a pear tree. I think she looks more like a Christmas dove, though, don't you? This illustration looks a bit out of place in the rest of my collection but I still like it. I think a couple of things happened here. There just wasn't a place to include some of the pattern motifs I've been working with (other than on the plate). The other contributing factor is that the brushes used in this illustration are not consistent with the first two illustrations (or the later ones). I began this illustration in a new document and do not yet have my brushes saved to their own library. So I had to make some new brushes and the settings were different. It was after completing this illustration that I set up the template file that I'm using for the rest of the collection. I drew this in honor of my friend Shelley Brandt of Figgy Pudding Designs. Merry Christmas, Shelley! A folk angel by Amber Lynn Benton for #ItsAdvent 2016. This image will take you to my Instagram account where you can follow my #ItsAdvent illustrations! It's just a few short days until Thanksgiving and then the Advent season is upon us! It's hard to believe that it's been only a year since I carved out this little studio corner in my bedroom and began to take myself seriously as an artist illustrator. Last year I joined in another artist's Advent Instagram challenge and I had a lot of fun. This year I decided that I wanted to do all 25 illustrations for Advent for my portfolio which meant that I needed to begin planning in October! 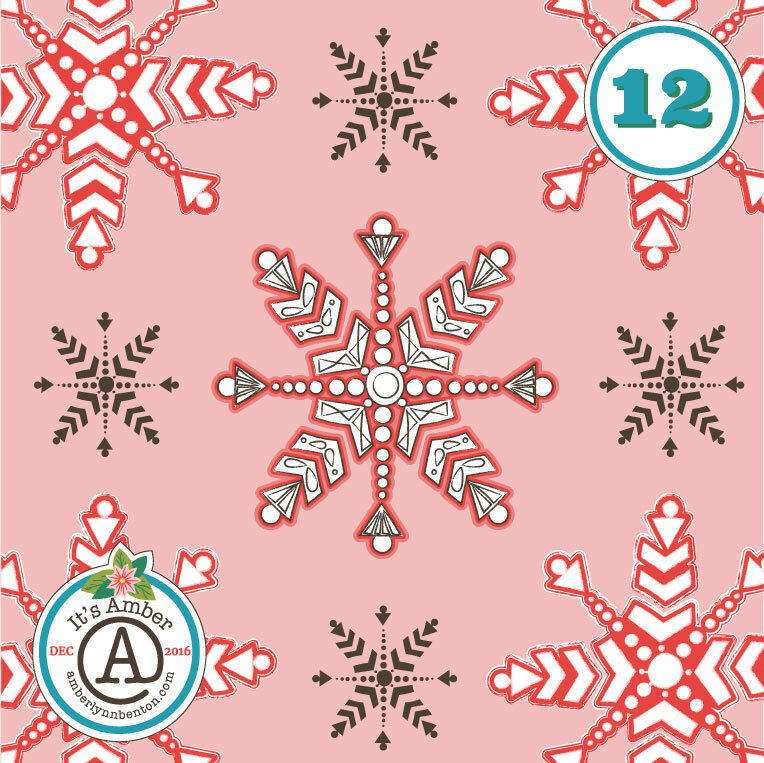 Below is the Advent Challenge Calendar. Feel free to pin and or copy and share the image. I'll be posting this to my Instagram account in just a couple of days. If you want to join in on your own Instagram account just regram the calendar! Click to open a larger version to download and share! I also created an image for Instagram that is unbranded (without my logo) for your to use on your own accounts. And here is a pin for your Pinterest boards! I hope your enjoy the challenge and I can't wait to see what you create!